Officials said they wanted to physically verify the claims. The development comes hours after the poll watchdog cancelled the election to Vellore Lok Sabha seat following seizures of huge quantity of illegal cash from the constituency. A joint team of the Election Commission and the income tax department on Tuesday raided DMK leader Kanimozhi’s house in Tuticorin, amid allegations of illegal cash being stashed in the premises. Officials said that they wanted to physically verify the claims. The development comes hours after the poll watchdog cancelled the election to Vellore Lok Sabha seat following seizures of illegal cash. According to reports, more than Rs 11 crore was seized from a godown linked to DMK candidate Kathir Anand in Vellore. So far, the tax department has seized over Rs 500 crore of illegal cash from across the state. The raids were part of a state-wide search to unearth illegal cash stashed by political parties meant to be used during elections. Last week, searches were conducted at 18 locations in the state, including Chennai, Namakkal and Tirunelveli. 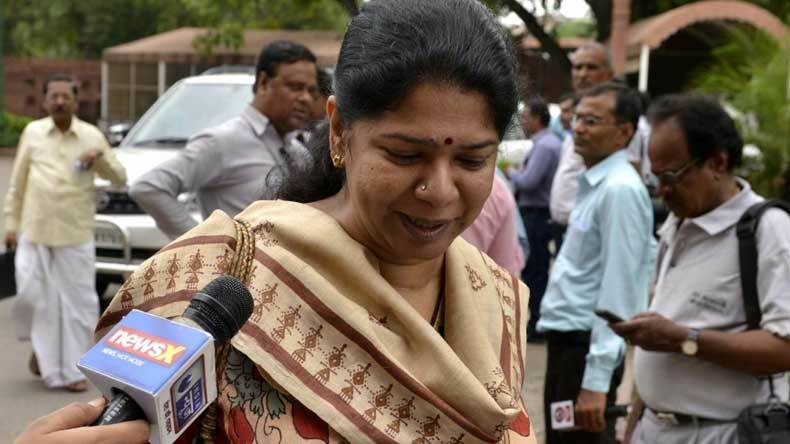 The IT sleuths entered Kanimozhi’s Kuringi Nagar residence in Tuticorin, hours after the campaign for the April 18 elections came to an end in Tamil Nadu. Around 10 officials from the IT department and flying and static squads were part of the team. A senior IT official said that the department had received information from the Tuticorin collector that the upper floor of the house is being used for storing cash. He added that two squads had entered the house of the Rajya Sabha member and sister of DMK chief M.K. Stalin to check whether any money is being stored there. A total of 39 Lok Sabha and 18 assembly seats will go to polls in the second phase of elections in Tamil Nadu on Thursday. Reacting to the raids at Kanimozhi’s house, DMK chief M.K. Stalin asked why there’s no raid at Tamil Nadu BJP chief Tamilisai Soundararajan’s residence where crores of rupees are kept. He claimed that PM Modi is using the IT, CBI, judiciary and EC to interfere in the elections as they are afraid of losing.